What do you guys think of the use of suppressors aka silencers in CQB? Dramatikk wrote: What do you guys think of the use of suppressors aka silencers in CQB? Only if you use subsonic rounds. Some people (yes, the not so smart ones) don't even think about that. They are traveling very slow compared to normal rounds. Energy is 0.5 times mass time the velocity squared. Subsonics are squaring a number less than 330. 5.56 ammo is squaring 905 at the muzzle for comparison, silencers do the opposite and allow more expansion of the escaping gas. Subsonic rounds travel below the speed of sound so they don't produce a crack upon whizzing past your head if the shot is missed. The propellant is of a faster burning nature and subsonics normally do not have a pointy tip due to no aerodynamic advantage. Subsonics are normally the third of the mass of a normal projectile. Not all subsonics cycle the bolt. Subsonics aren't as commonly used. Will not penetrate a whole lot but at the same time, it won't make you go deaf in a small enclosed space. Always benefits for night fighting with reduced muzzle flash and noise or using a distraction device while engaging - this can help with being undetected. 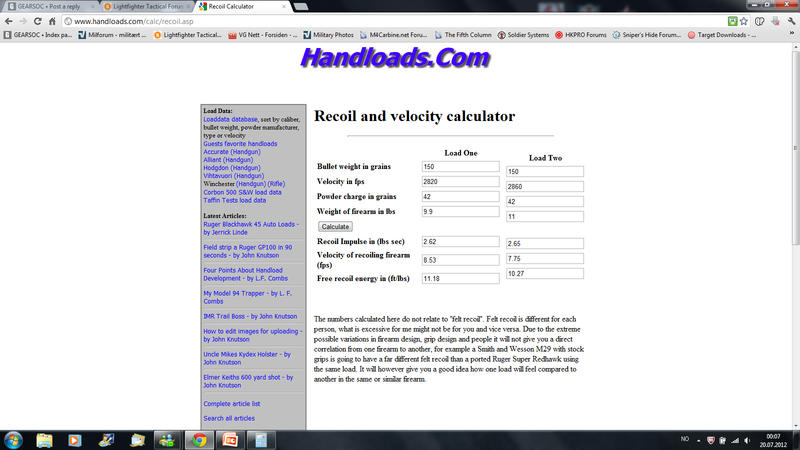 And of course, less recoil, great for CQB. Some people say that using a silencer and supersonic round then it's basically like a longer barrel and will give you a bit of increased range due to extra muzzle velocity, known as freebore boost. In CQB you'll always have the noise of your action (cycling), muzzle blast (though quieter) and the noise of the projectile impacting. Last edited by Ryan on Fri Apr 22, 2011 10:04 am, edited 1 time in total. "For 99% of uses, subsonic rifle rounds are STUPID. Subsonic rifle loads are a very niche item. Because they are traveling at typical service handgun caliber velocities, there are minimal stretch effects and uncomplicated soft tissue wounds are very similar to those caused by non-expanding handgun projectiles. Some subsonic loads do indeed use very long, heavy, pointed rifle projectiles (like the .30 cal 220 gr SMK OTM) that may, depending on shot line and tissue thickness, yaw over while traversing through the body. If this occurs, the permanent crush cavity can be a bit larger during maximum yaw than when the projectile is point or base forward. In any event, subsonic rifle projectile wounds are substantially less severe than wounds caused by normal rifle loads." - Dr Gary K. Roberts. 1. Does not lower the muzzle velocity. Often increases a few FPS due to longer effective barrel. The bullet does not touch the baffles at all. No one makes a "shoot through" suppressor anymore, where you shoot through solid baffles with the first rounds. 4. Can be used in machineguns and .50cal rifles. 5. A suppressor made for machinegun can be used with extremely long bursts. 6. Does not make the accuracy worse, often improves it slightly. 7. The POI change is usually small, often in the class of 20mm at 100m. A rifle with long, thin barrel gets affected more than a one with short and thick one, due to obvious reasons. 8. Gets hot in repeated shot rifle use and very hot in machinegun use. ("Look at me!" in Thermals..) Looking through a scope when you have a very hot suppressor on the end of the muzzle = lots of mirage. Bad for long range. 9. Rifle with subsonic ammo and a suppressor is really silent. Less sound than an air gun. Still it sends lets say a 12 gram 7.62mm bullet at just below the speed of sound, and therefore still has nice punch. 10. They are made of steel. You can break a lightweight one if you shoot 12 magazines full auto. A machinegun-suppressor on the other hand doesn't care about such minor things. 11. Increases the cyclic rate of full auto weapons due to increased back pressure to the gun mechanism. A sound suppressor with subsonic ammo would be handy if the team did not have hearing protection. I dunno where this could happen, but it probably does. Interesting article, Dramatikk. I'm going to disagree with the article however, based on all of the facts that Ryan already indicated. In my experience, which has been extensive, there's always a work-around. I've used a radio earplug in one ear and a cotton ball in my other to maintain comms and still have some hearing protection. Just my humble opinion. I do understand the concern, however, I'm probably a candidate for hearing loss at some point, myself. "Suppressors reduce the firing signature (both flash and dust/vegetation), reduces recoil and reduces sound. Unless shooting subsonic ammo, the supersonic crack of the bullet in flight will still be heard. Suppressors do not reduce accuracy or the terminal ballistics of the weapon. With regards to accuracy and suppressors, depending on quality, you can have a suppressor that provides a return to zero when taking off and on, suppressors that have a constant POI shift when attached, or you can get suppressors that needs to be zero'd before use." 5. Some suppressors increase accuracy -> can be due to change of barrel harmonics, change/calming of turbulence around bullet when leaving muzzle"
"Suppressors can increase muzzle velocity through a very simple physics formula. Basically the suppressor makes the barrel longer. Therefore, it increases the distance the bullet must travel to leave the barrel. Because it takes longer, the force of expanding gas is acting to accelerate the bullet that much longer as well. The longer the bullet is being accelerated, the higher is the exit velocity. From the Newton's law, it is impossible to increase velocity and reduce recoil. If you look at the rifle as an isolated system, then whatever force the expanding gas delivers to the bullet, same force must be delivered onto the rifle. The net recoil from firing a suppressed weapon may be PERCEIVED by human to be lower, simply because the impulse takes place over a longer period of time (see the first part of the comment), but the total energy transfered into the shoulder is greater. If you introduce the concept of a muzzle break, then you are indeed reducing total recoil, but then it cannot possibly be a suppressor simply because of its mechanics." "Well, didn't intend for this to become a physics discussion, but since you threw down the gauntlet, I have to pick it up. Primary Recoil is what you are describing in your post, the momentum of the bullet traveling in one direction, and the momentum of the rifle traveling in the other direction. This is where Newton's 3rd law comes to play -> equal and opposite reaction. The physics that explain this primary recoil is conservation of momentum. This is NOT the recoil mainly felt, but it is noticeable. The primary recoil cannot be reduced, since it only represents the conservation of momentum of the gun-bullet system. Secondary recoil is a result of the escaping gases from the muzzle, causing the muzzle to recoil like a rocket. This is the main recoil felt when shooting a firearm. This recoil can be reduced by adding muzzle devices to redirect the escaping gases. 1. You neglected to add mass to the equation, from the suppressor. Even though both values increase, the net effect might not be an increase in recoil. 2. A suppressor does not function as a bore, so what you are describing does not happen. I'll adress point number 1 first. Let's throw down some numbers to illustrate the effects of primary recoil on a rifle, first unsuppressed, then suppressed. Let's say that the gun is a .308/7.62, shooting a bullet that weighs 150 grains/9.7 grams at a velocity of 2820 ft/s, or 859 m/s. The gun weighs 9.9lbs/4.5 kgs without a suppressor. Momentum (P) is mass (m) times velocity (v), or P=mv. Let's work out the momentum of the bullet (b). The momentum of the bullet is 8.3kg m/s in the forward direction. Now, let's add the suppressor. For this example, let's say it adds 40 ft/s or 12 m/s (an actual number I found online). This makes the new velocity of the bullet 2860 ft/s or 871 m/s. The weight of a Gemtech .308 suppressor I found was 17.5 oz, that equals 496 grams or 1.1 pounds. The new weight of the rifle is 11lbs or 5kg. So, primary recoil is in fact less suppressed, than unsuppressed. As you can see, there is more free recoil energy in the unsuppressed gun, than there is in the suppressed gun. Now to point number 2, how a suppressor actually works. You stated that the suppressor adds OAL to the bore of the gun, giving the bullet a longer distance to travel, and getting affected by the expanding gases over a longer period of time, thus increasing velocity. Well, not exactly. The inside of a suppressor is not a bore. If it was, it would not reduce the muzzle blast or flash. The loud muzzle blast is a result of the hot expanding gases escaping the bore, and hitting the colder air outside the gun. A suppressor is a cylindrical container and, depending on design, is divided into several chambers by baffles of cylinders. These baffles or cylinders capture the gases behind the bullet, giving them more room to expand and burn off propellant, thus slowing them down as well as cooling them down. The result is reduced noise and visible flame from the muzzle blast. The actual phenomenon that causes the increase in velocity is called freebore boost, and is caused by the expanding gas inside the suppressor still pushing on the bullet, without the drag of the rifling affecting the bullet, leading to a slight increase in velocity, numbers vary between 10-50 ft/s. It not nearly as effective as additional length of bore, which can add 50+ ft/s per inch of extra bore. Muzzle breaks on the other hand do not reduce noise from muzzle blast, as it does not slow or cool the expanding gases. It does however divert the expanding gases to the sides or up, in order to counteract the muzzle flip caused by secondary recoil." Special Ops use suppressors for mainly flash suppression. If any 'quiet' shooting is to take place there is individuals with mp7 suppressed to handle it. Suppressors are important in dangerous, possibly explosive environments,such as clandestine labs...i need to find some official statement about this , could you help me? Its for our SOP purposes. Thank guys. "Sound suppressors are exceptionally effective flash suppressors. This is an important consideration when used in the flammable atmosphere often encountered in drug labs." "Another reason to reduce muzzle flash is to minimize explosion danger during warrant service in a location that is suspected of being a clandestine drug lab. a muzzle flash in this environment can be catastrophic for everyone in the room or even the building." Reduces the risk of a fire or explosion whilst operating under such conditions. On the topic of gear, you need to fully kit up - oxygen kit at the ready because in some drug labs the chemical mixtures and solvents push oxygen out of parts of the room leaving a no oxygen zone. I found that in tacticalmedicine, but there is no reference to some valid source. Gem-tech site doesnt work for me. Which talk about the flammability of some of the gases found and the dangers associated. "Meth labs present extreme dangers from explosions and exposure to hazardous chemicals." "When operating in explosive or combustible environments, such as is often the case when raiding clan labs, the muzzle flash obviously poses additional and potentially life-threatening problems". "Adding a little water will cut down on first round flash (important to the DEA in ops like raiding meth labs where the environment might be explosive)." "Methamphetamine and meth labs pose a chronic problem to law enforcement. Tactical teams must take into account the explosive nature of volatile solvents used in these labs when they plan and execute search warrants. The reduction of muzzle flash was a primary reason that the North Dakota Bureau of Criminal Investigation acquired Agenda Six suppressors for their entry team’s MP-5s. This has been the reason for several other teams to acquire suppressor technology as well." "I would also suggest you read up on muzzle flash from suppressors. Some cans will generate a very large muzzle flash at night." I cannot find anymore references, nor can I find any official sources. badger wrote: Suppressors are important in dangerous, possibly explosive environments,such as clandestine labs...i need to find some official statement about this , could you help me? Its for our SOP purposes. Thank guys. important is ammo, and type of gun for this not sound suppressors. Explain? Subsonic ammunition? Smaller caliber or type of weapon? No doubt suppressors make communication easier - I'd have loved for everyone to have them when trying to shout orders with people shooting in other rooms during MOUT training! If using a short-barreled weapon like the HK416K, Colt Commando etc., the barrel length with a suppressor on will be basically the same as the full-length version. In a CQB environment like a house raid, the decreased barrel length won't really matter all that much. In that case, madness not to use them, really. Especially if trying to keep quiet. They also decrease muzzle blast from designated marksmen/snipers, reducing chance of detection by dust getting kicked up. "SMG like HKMP5 (K,A5,SD6), or KRISS, or CZ Scorpion EVO III or another else ... you shoot and flames sometimes are going out from brass ejector...inert gas? suppressor? LOL how can it help you if from another side near chamber is ejector with flying brasses and times to times with flames. best option is shotgun, not short barrel and with ammo with special gun powder. 8.5mm bucks. 24pcs. one shot one kill, in shotgun barrel there is a lot of space for burning powder, no flames. ejection is not making when the powder is exploding in barrel. you shoot, than reload. shoot reload. with mp5 30 rounds 30 shots, shotgun 2 shots 48 rounds"
Anyone here use suppressor socks? Anyone here shoot thumb-over-bore with such?